The racing season starts as soon as ice conditions permit. We race every Sunday afternoon on one of our two ponds. We race at Berry Pond on Route 25 in Moultonborough, NH as well as Lee Pond on Blake Road in Moultonborough, NH. We have an annual fundraising event called the "LATCHKEY CUP". It benefits the local communities. This event is always scheduled for the last Saturday in January at 10 am. 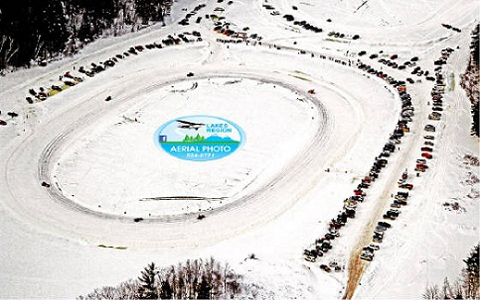 We hold this event each season and invite other ice racing organizations throughout the Northeast such as the New England Ice Racing Association (NEIRA) and the Jaffrey Ice Racing Association. Please log onto this site for week to week coverage throughout our racing season! We have over 30 wonderful years in our club with many different faces taking part in our organization. We would like to thank you all! We created this club to promote racing during the winter months. Our club is made up of various drivers ranging from the dirt, asphalt and drag racing! Our club is blue collar racing at its finest!